I adore prune plums and really the only thing bad about them for me is that they signify the end of summer. I love fall; I live in New England, after all, but the LONG winter just comes too damn fast. 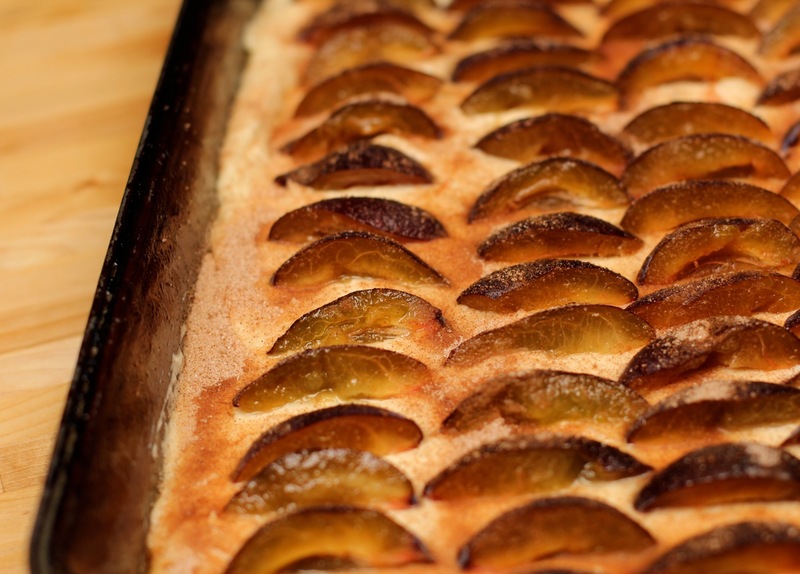 Anyway, while I can eat these tiny plums by the half-dozen easily out of hand, they also work very well in baked goods. 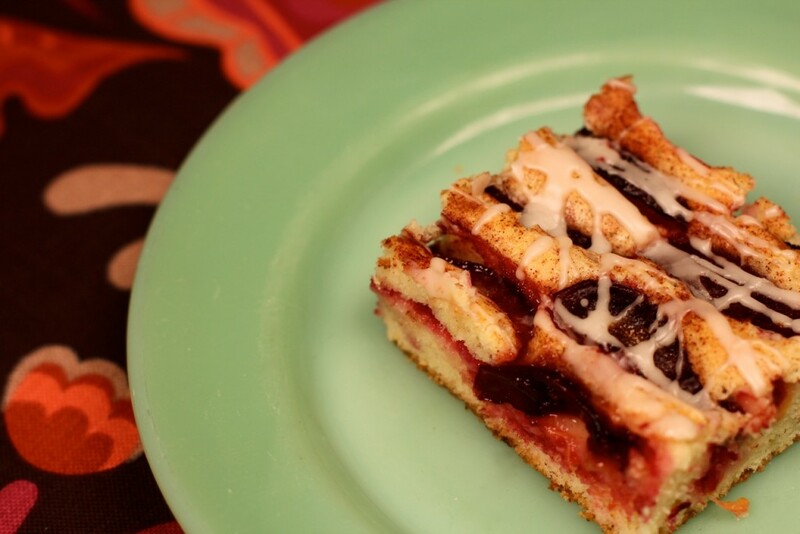 Recipes abound for plum kuchens and coffee cakes but I wanted to try this version because the cake component itself is a bit more substantial than most. It is a fabulous pairing. The cake is buttery and rich, the topping is fruity and juicy. It truly doesn’t need the vanilla glaze, so feel free to leave out, if you like. Carole is a friend and I truly enjoy reading her books; I have them all. Her approach to flavor and baking technique is similar to mine and when I read her recipes I feel very much at home. Her addition of a couple of tablespoons of oil to the batter is inspired and gives us a very moist cake. She recommends larger plums such as Santa Rosa or Black Diamond. I used prune plums because that was what was available. Your choice! I can’t wait to try this cake with other fruit on top, too….I can see it with peaches, plums, nectarines, any of the stone fruits for sure. Take Carole’s advice and serve this warm for a truly special snack cake experience. Tip: the half and half for the glaze must be hot to blend well with the rest of the ingredients. You can substitute milk or other type of cream. For the Cake: Position rack in middle of oven. Preheat the oven to 350º F. Coat a 13 x 9 x 2-inch pan with nonstick spray. 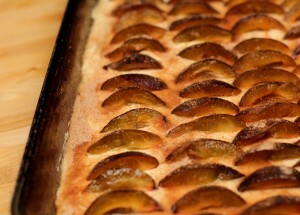 Cut the plums lengthwise in half, remove and discard the pit then slice each piece in half again lengthwise; set aside. Whisk together the flour, baking powder and salt in a medium bowl to combine and aerate; set aside. Beat the butter until creamy, about 2 minutes with an electric mixer on medium-high speed. Add the sugar gradually and beat until very light and fluffy, about 3 minutes, scraping down the bowl once or twice. Beat in lemon juice, vanilla and zest. Beat in the egg mixture a bit at a time, scraping down after each addition, allowing each bit of egg to be absorbed before continuing. Add the flour mixture in three additions and beat briefly until smooth. Scrape batter into pan and smooth top with a small offset spatula. Arrange plum slices evenly on top of batter (see pic). For the Topping: Sprinkle lemon juice over plums. Stir the sugar and cinnamon together in a small bowl and sprinkle evenly over all. Bake for about 35 to 40 minutes, or until a toothpick inserted into the center shows a few moist crumbs when removed. The cake will be light golden brown and the edges might have begun to come away from the sides of the pan. Cool the pan on wire racks for about 10 minutes. Meanwhile, make glaze, if using. For the Glaze: Place confectioner’s sugar in a bowl and whisk in 3 teaspoons of hot half and half, corn syrup, vanilla, lemon juice and salt. Add remaining half and half if necessary to create a smooth, pourable glaze. Drizzle glaze free-form over cake with a fork. Serve immediately. Best served the day it is made.